Pedigree Charts: How Do I Get Started? This is probably one of the most common things I hear people say when I encourage them to look into their family history. My first suggestion is to not think too far ahead-start with the absolute basics. To begin-let’s have a look at a Pedigree Chart. 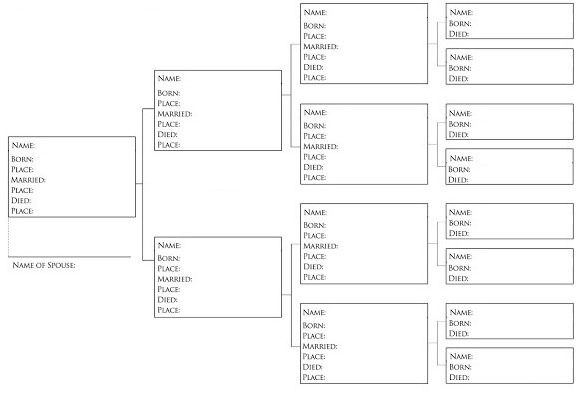 A pedigree chart is what comes to the mind of most people when they hear, “family tree” or “genealogy”. It’s the tree like chart that shows the people you directly descend from. Due to lack of space, most printed versions don’t typically show a whole lot for siblings, aunts, uncles, etc. Once you start using genealogy programs to build your tree-there is more space and flexibility to show other descendants of your ancestors. Looking at the pedigree chart above, you are the base of your tree (far left box). Like any other family member or ancestor, your story matters. Take a second to fill out your full name, date and place of birth, date and place of marriage and the name of your spouse (if you are married). If you are filling this out-you are obviously still alive and kicking so we can skip date and place of death for now. Besides being a sobering reminder of our mortality, there is another reason/need for the date and place of death in the first box. We’ll get to that in a bit. Next you move on to your parents. There are two ways of doing this… you can fill it in yourself (if you know your parents birth, marriage and death information) OR (if your parents are living) you could call, email or visit them and ask them for help filling in their boxes. Now move on to your grandparents. If you are lucky enough to have your grandparents-VISIT them and ask them for help! If they have passed, ask your parents for help filling in their parent’s information. If your parents have passed-reach out to your siblings, aunts, uncles and cousins for help. You’d be surprised by how much information other family members might remember. They may even have documents on hand that will provide you with information you’re looking for. With any luck, as you reach out beyond your immediate family, you may find another family member who is also researching the family. It’s like hitting the genealogy jackpot when this happens. You could end up with a ton of new information with one phone call, email or visit… again I suggest visit. You are going to continue to work your way as far back as you can go with the help of your family. As you do this, you are going to see holes of missing information. Take note of the missing information-the next step will be learning what documents are needed and where to go in hopes of obtaining the information. What If I Have The Names Of My 2nd Great Grandparents? On a new pedigree chart, you will fill in the base of the tree (the far left box) with the information of one of your great grandparents. So, the last generation on your first pedigree chart becomes the first generation or “base” on the next. You will have one new pedigree chart for each great grandparent (total of 8) filling in the names of their parents, grandparents, etc. as you discover the information. Run out of room again? Repeat-last generation becomes base. It really doesn’t have to be. Like anything else, it’s all about breaking the entire process down into smaller steps. Step One- Start With The Basics. I always suggest that newbies start on paper before jumping to the technology that’s available. The sheets that I introduce you to will help you understand the basics and give you an idea of what you should be looking for. Once you get a feel for the process, you can use the sheets to input the information into a genealogy program. Next week, I’ll introduce you to another worksheet that will help you gather and organize more information about your family, beyond what can fit on the pedigree chart. Until then-get a feel for the pedigree chart and if you have any questions don’t be shy! Leave them below in the comments and I’ll get back to you as soon as possible. Have fun and good luck!! I love the idea of starting a whole new chart when you get to the great-grandparents, etc. It’s frustrating when you are trying to get all of the info for many greats onto one page. I now have a way to make everything much easier to see, and add to as well! I have been wanting to start a tree. Thanks for posting this. It’s very addicting and extremely rewarding. Keep an eye out, I’ll be posting more “How To” type blogs! Born and raised in New England, Kris is known most for her work as a Historical Researcher on two popular Syfy shows. Following her TV days, she turned her focus back to her life long love: genealogy. Today, she looks to share her addiction, hoping to inspire others to research their own family history.